Ever wanted to rent a Dunk Tank and it was too cold, or you were told that children under 5ft. tall could not enter??? 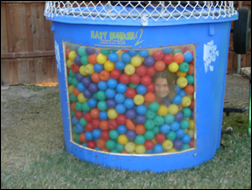 Well, problem solved with the Ball Pit Dunk Tank. Rather It's getting dunked or doing the dunking, Kids and Adults absolutely LOVE IT. Can be used Inside also, if Door width is large enough.